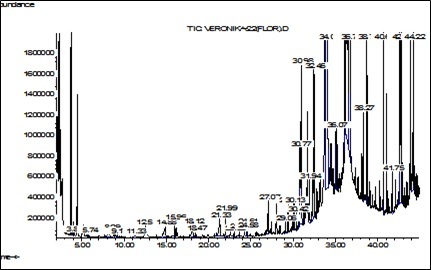 By means of chromatography-mass spectrometry the essential oil composition ofV. longifolia L. had been studied for the first time. In the result of the study 63 compounds had been identified and quantified, of which 38 had been found in flowers, and 53 – in leaves, 57 compounds had been identified, 28 of the identified compounds had been found in both samples of herbal drugs, including aromatic compounds, terpenoids, sesquiterpenoids, fatty acids and their esters, carbohydrates. The amount of triterpenoid squalene was high in all studied samples. Alina Osmachko, Alla Kovaleva, Olga Goryacha, Tatiana Ili’ina. Сomponents of essential oil of Veronica longifolia L. leaves and flovers. 2014; 3(1): 01-06.